Instructional photo tours/workshops include morning and afternoon field photography while the light is warm (weather permitting), in-the field instruction, photo discussion/critiquing, and Photoshop pointers. There will be a midday break for lunch, downloading images, recharging batteries, and maybe a even a little rest for the weary. Most tour/workshop costs do not include lodging, park entry fees, transportation, meals or other miscellaneous expenses like boat rentals and captains fees (unless specified). Ground transportation with the leader (Larry Ditto) is available on some tours on an extremely limited (2 people limit), first come, first served, pay in advance basis. This can be a huge advantage as it is a perfect time for Q&A and, at locations like Bosque del Apache, we do a fair amount of photography from the car. We can also use travel time from motel to shooting site for instruction, as well. The cost is $30 a day. Call or e-mail to check availability. Do know that most of these trips are identified as “instructional photo tours” because I photograph right along with you. I am, however, always available to answer your questions, offer guidance, and assist you with your photographic needs. In addition to the in-the-field time, there is much teaching done during lunches, dinners, and breaks. On trips where we have co-leaders, you will find them to be extremely competent instructors and knowledgeable photographers, as well. As space allows, non-photographer spouses/companions may join tours for $20/day. This is only if your spouse/companion will be joining us in the field or attending workshops, tours, or discussions with the group. Trip extensions for individuals or groups can be arranged on request. This provides opportunity for individual instruction on location. Extensions are available for $300 per day or $225 per day each for two or more photographers. In the event of inclement weather (rain, tornado or plague of locusts), private days may not be canceled. We will work indoors viewing images via laptop, using Photoshop, handling equipment, and getting out to photograph as conditions permit. 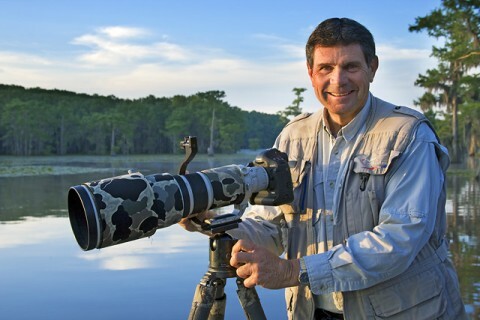 For some time now, Larry Ditto Nature Photography, has had a liberal deposit/cancellation policy. Unfortunately, we occasionally get cancellations just prior to the beginning of a tour. These cause financial hardship for me, hence, this new policy. Please check your schedule carefully and seriously weigh your decision to join a tour/workshop before sending a deposit. That being said, do note that many of the tours/workshops fill up months in advance. A $200, non-refundable deposit is required for all tours/workshops unless otherwise specified. Deposits are due upon registration. The tour workshop balance is due 30 days prior to the tour and NO portion of the balance is refundable. Please be aware that some trips may have additional non-refundable fees for items such as boat rentals, meeting room rentals, etc. Larry Ditto Nature Photography accepts personal checks, money orders, and credit/debit cards via PayPal. If you wish to pay with a credit or debit card, please contact me and I will send you an invoice to allow you to use PayPal for the transaction. ** A 4% transaction fee will be added to all PayPal billings.